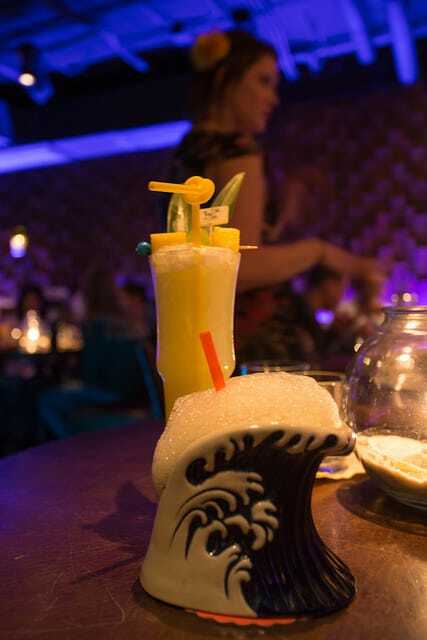 Chicago Tiki Bars: Lost Lake and Three Dots and a Dash | Good. Food. Stories. 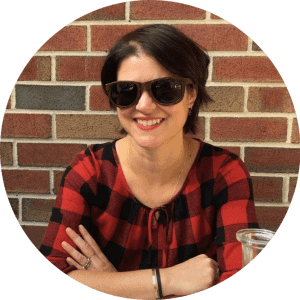 Chicago has always been a city of marvels: the 1893 Columbian Exposition, the daring architecture of Louis Sullivan and Frank Lloyd Wright, public sculpture from Picasso to The Bean, pizza with a backbone and hot dogs run through the garden. It stands to reason that a city this ambitious and sprawling needs not one but two* tiki bars within city limits. Being a casual tiki connoisseur, I thought it only proper to visit both in the space of one weekend. Just off the Blue Line Logan Square stop sits Lost Lake, a charming tiki den tucked behind a a windowed storefront. 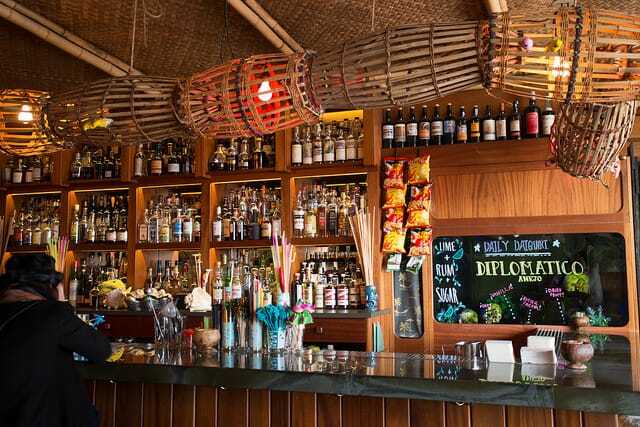 The banana leaf awning and tiny neon sign whispering “tiki” give the game away; once inside, more banana leaves, bamboo, wicker, and an impressively stocked bar make it very clear you’re in the right place. Though the vibe is low-key and mom-and-pop-esque, there’s nothing slapdash about any element of the Lost Lake experience. Riotously garnished cocktails showcase the extensive stock behind that warm wooden bar: mostly modern interpretations of traditional tiki drinks, with a few gently tweaked classics like the Fogcutter and the Beachcomber, as well as an ever-changing Daily Daiquiri. Unlike many tiki palaces, which cut off the outside world for a moody, all-enclosed fantasy environment, if you arrive soon after Lost Lake opens at 4:00 pm, you’ll catch a few rays of sunlight through the netted orbs dangling and partially obscuring the front window. Arriving early is a good idea for a few reasons: one, because no reservations are accepted and the airy but cozy space can fill up quickly as the night goes on. And two: because focus here is drinks only, with only a few chips and snacks on offer, you will probably want something more significant to soak up some of the effects of your potent sips. Though you can order delivery from the neighboring Chinese spot, my recommendation would be to walk down to Lost Lake’s sibling restaurant, Longman & Eagle, for beef fat fries at the bar. 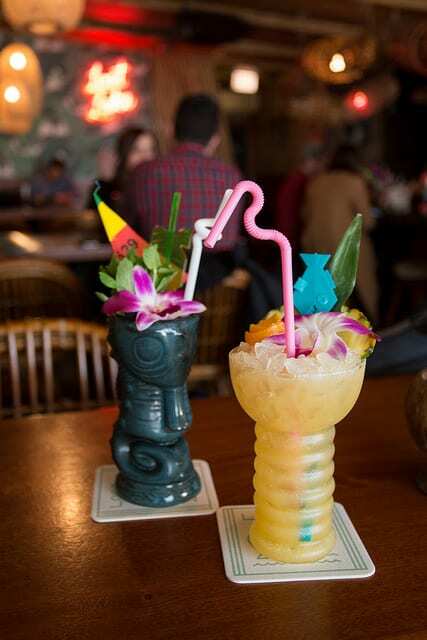 For the opposite experience, head down to the River North neighborhood for a full-on dose of tiki glamour at Three Dots and a Dash. (Fun fact: acclaimed cocktail guru Paul McGee is the the co-founder of both spots; he departed Three Dots to open Lost Lake.) 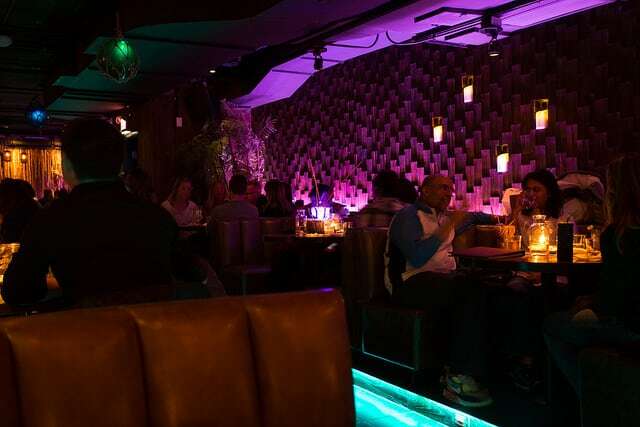 Three Dots is the opposite of a casual neighborhood tiki bar: from your first steps past the glowing blue skull wall to its cavernous subterranean rooms, you’ll know to recalibrate your mindset and immerse yourself in the moment. The faux speakeasy entrance is much more well-marked than it used to be when Three Dots first opened, but it’s still a little sneaky. Though the bar’s address says it’s on Clark, enter via the alley on Hubbard, next to Firecakes Donuts. (Take note of Firecakes, because you’ll probably need a donut the next morning after your tiki adventures. But that’s for another post.) If you’re arriving late enough, you’ll see the blue lights bouncing off the stone buildings, and there will probably be a line and definitely a bouncer. If you’re a fan of the Disney-ish oversaturated, heightened sense of reality that comes with the tiki experience, you’ll dig everything about Three Dots and a Dash. If you yearn for rustic island escapism and the breezy vibe of a hideaway spot, you’ll feel right at home at Lost Lake. Me? I love both in equal measure, and would never think about choosing one Chicago tiki bar over the other. The city is big enough for both of them. Lost Lake: 3154 W Diversey, Chicago IL. Opens at 4pm daily; no reservations. Three Dots and a Dash: 435 N Clark, Chicago IL. Opens at 5pm Sun-Thurs; 4 pm Fri and Sat. Reservations recommended. *This, of course, doesn’t include the two long-standing suburban spots of tiki lore, Chef Shangri La and Hala Kahiki. Those I have yet to visit, so look for a followup post in 2018.